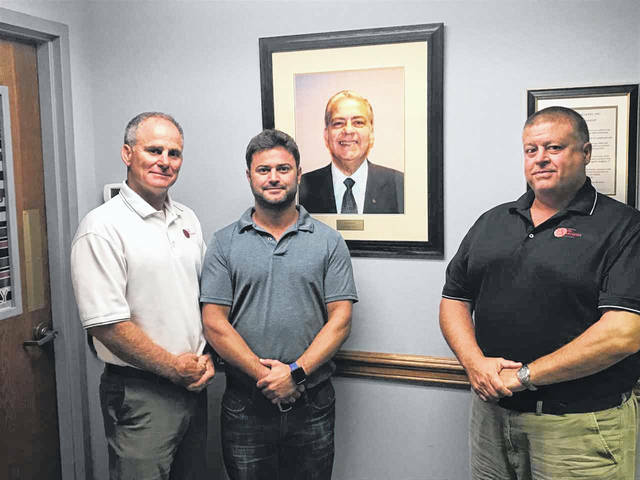 From left to right: Brian, Sean and Rod Meade stand in front of a picture of their father and grandfather, Russ Meade, who founded Meade and Associates in 1978. The company recently celebrated its 40th anniversary. “It was huge. It was a very nice surprise,” President Brian Meade said of the honor from the chamber of commerce. Meade and Associates was founded by Russ Meade in 1978 in an office in Worthington. With just one employee — a secretary — Russ handled both the collection and sales calls initially. Brian joined his father as a collector and the third employee of the business when he got out of school, as did Russ’ other son, Vice President Rod Meade. In 1988, 10 years after opening the business, Russ had his own building built that still serves as the location where his sons have continued operations today. Russ passed away in 2002, having never stopped working despite his health doing its best to slow him down over the final two years. Rod called his father’s work ethic “impeccable,” saying he was in there every day, including Saturday and Sunday, all the way to the end. He said both he and his brother were given a great opportunity by their father, and they were sure to take full advantage. Today, Meade and Associates employs 31 people. Their client base has grown to consist mainly of universities and health care providers, among others. Both brothers are well aware of the negative stigma surrounding collection agencies, but they hope people understand the need for their services and the need for creditors to receive money that is rightfully owed to them, but also going about that process the right way. According to a study by the Association of Credit and Collection Professionals (ACA), $67.6 billion was returned to creditors in the United States in 2016 by way of the third-party debt collection industry, highlighting the need for the services companies such as Meade and Associates provide. But lasting for four decades takes more than just a market need. Asked how their company has stayed viable for 40 years, Brian’s answer was as humble as the company’s roots. Truly a family business, the third generation of the Meade family is waiting in the wings in Brian’s son, Sean. Along with Tony Martini, who has been with the company for around 15 years now, Sean will be tasked with carrying on the legacy his grandfather started and his father and uncle have continued.